Here at MYKD, our design ethos is grounded in our belief that health and sustainability are integrally connected. Our approach is to design holistic environments that promote both human and environmental health, weaving them into memorable and inclusive experiences. By drawing people in, we show them the impact they can have on the places where they live. Detroit has distinct seasons— with often dangerous heat waves during the summer and very cold winters—making experiencing outdoor landscapes challenging. Additionally, in the face of a changing climate, Detroit is projected to see increased rain and flooding during the winter and spring months, while the intensity of summer droughts and temperatures are expected to rise. 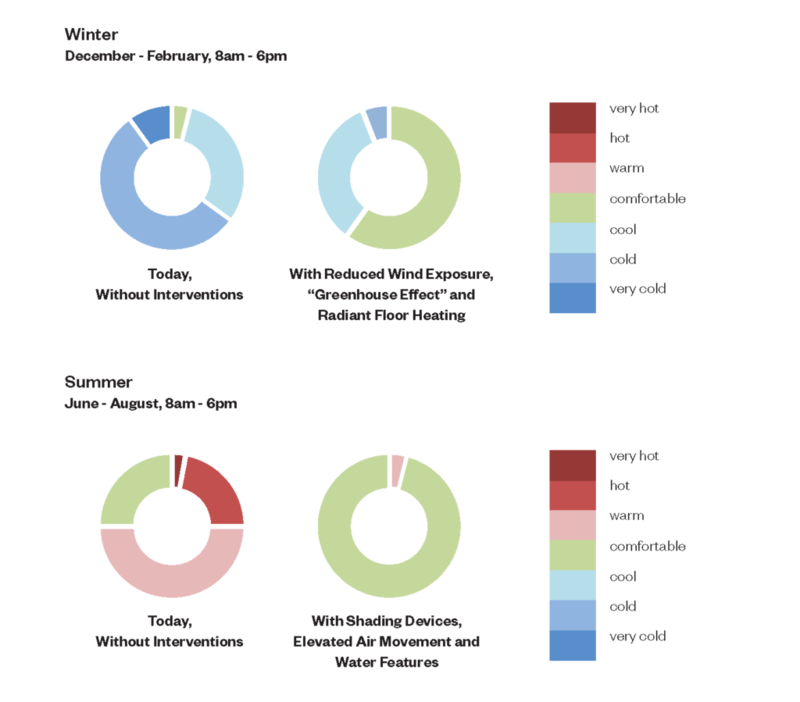 To temper Detroit’s extreme weather conditions, we systematize strategies that extend the landscape’s year-round usability by maximizing user comfort. Winter will activate heated paving, heated benches and screens to protect from wind exposure. In the summer, evaporative cooling fountains, shading and elevated air movement through the plazas and parks will moderate the heat. 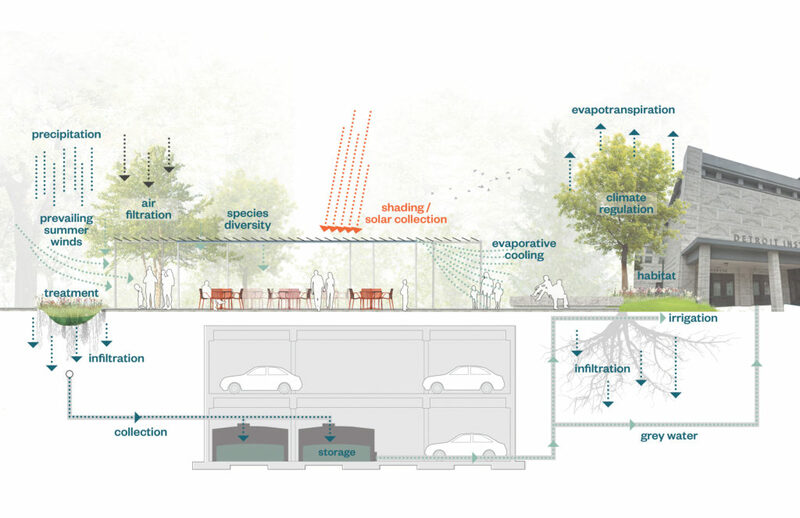 An increased tree canopy and canopy structures provide shade and protection from wind. Net zero kiosks throughout the landscape employ photovoltaics as well as passive heating in winter and cooling systems in summer, which make use of natural airflow, solar exposure and existing steam lines for radiant heating. By punctuating spaces with affordable elements that activate low-impact, environmentally sensitive processes, we can also help people feel at ease. Summer: In hot months, evaporative cooling fountains, shading, and elevated air movement will moderate heat. Winter: In frigid weather, the environment is warmed by ground plane benches, as well as screens to protect from wind. 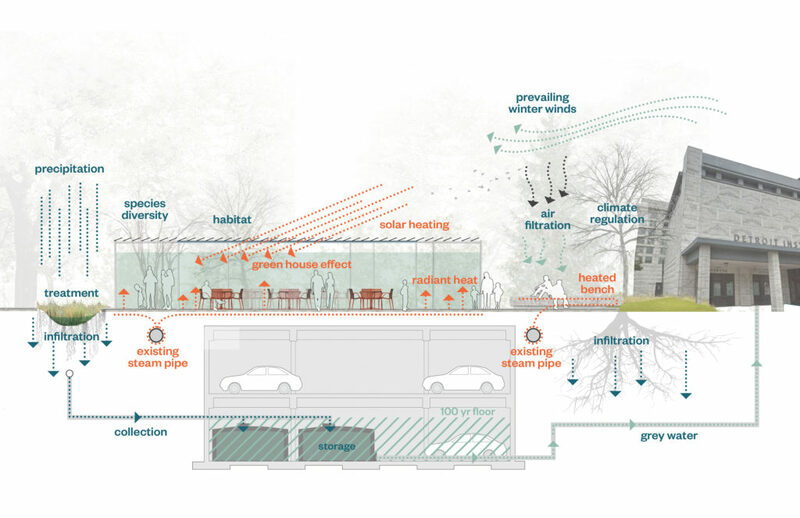 To help mitigate climate change and protect communities from harm, we investigated ways to collect stormwater, recharge groundwater, sequester CO2, and create renewable energy. Rain gardens, permeable paving, green alleys, and 550 new trees act as a sponge in the wet seasons and provides a habitat for a rich diversity of plants. This sponge will absorb and retain stormwater, while directing excess to below-ground cisterns where it can then be filtered and reused for irrigation, interactive fountains and greywater systems in existing buildings—collectively, this system will manage an estimated 400,000 cubic feet of stormwater. Stormwater could be further reduced by adding green roofs on existing buildings throughout the district. Vegetated areas have the added benefit of acting as a filter for the city. By removing particulate matter from the air, plant-rich communities see a significant reduction in serious health conditions, ranging from heart attacks to asthma. Filtering stormwater before it is captured or sent to the sewer system reduces strain on existing infrastructure, and protects habitat for urban wildlife. Once established, diverse perennial plant communities not only require less maintenance and water than a typical residential lawn, but vulnerability to widespread disease is minimized. This designed ecosystem approach is also better able to naturally evolve and adapt to the changing climate with a variety of plants fulfilling various ecological niches. Site wide, carbon production is further reduced through the design’s emphasis on enhancing non-motorized and shared transit. Pedestrian and bike infrastructure is woven throughout to complement new public transit amenities, encouraging active transportation and all of the health benefits that come with it. At the surface, recycled glass and granite paving materials, together with cool pavements, provide added layers of sustainability and beauty, making these environments both enticing and functional. Our plan to add 550 trees to midtown can sequester over 13.5 million lbs of carbon dioxide over the next few decades! Advances in sustainable design are not just important for the global environment but also for neighborhood health. These next-generation improvements present systemic ways to make the peak seasons safer and allow for families to understand the environmental systems that shape the world they live in. Most importantly- they can help our most vulnerable communities, including seniors, the underserved, and students, to participate more fully in public life. In Detroit’s case, someday we would love to hear meteorologist Paul Gross highlight the Midtown Cultural District as a cool refuge during the city’s more frequent dangerous heat waves. If our vision for the new cultural district is built, listeners could find the temperature 15 degrees cooler here compared to other areas within the city!